As a child, I never ate avocados. Not because I was put off by them, just because they were never on my radar. Back then, I wasn’t as interested in food, so it never occurred to me that avocados might be tasty. When I think about it, my first taste of avocados must’ve been in a California roll. Even after that, I didn’t equate the creamy green stuff in my sushi to the pebbly, greenish-brown, pear-looking rocks in the supermarket. I’m not exactly sure how I figured out that those “rocks” were mild, creamy, and rich tasting, but when I did, I would often eat avocados plain or with salt and pepper. But by far, my favourite way to eat avocados is guacamole. 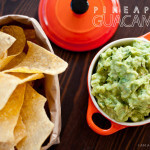 Guacamole is super addictive, especially with freshly deep-fried tortilla chips. This pineapple guacamole recipe was a happy accident. I just happened to have some leftover pineapple in the fridge, so I tossed it in. Sweet pineapples, creamy avocados and a bit of spice definitely brightened up my day! 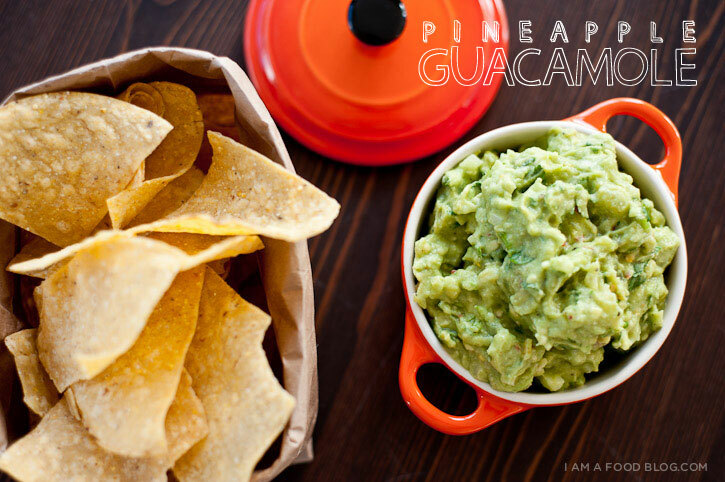 I am fresh, I am spicy: I am PINEAPPLE GUACAMOLE! Cut the avocados in half, remove seeds and scoop into a bowl. 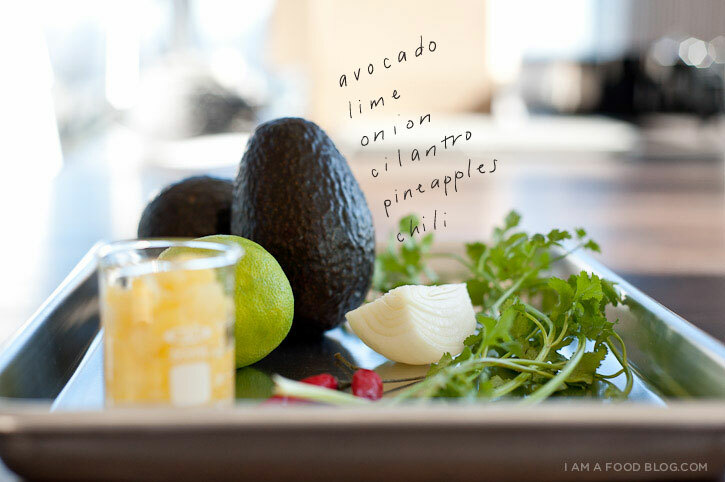 Use a fork to roughly mash the avocado and add the onion, cilantro, pineapple, chili and lime juice. Stir to mix and season with salt and pepper to taste. Serve with tortilla chips. Enjoy! Interesting addition there but I’m sure it definitely kicks up the guacamole a notch! Gorgeous photos! Wow just found this blog through a post on pinterest your photography is amazing!!! 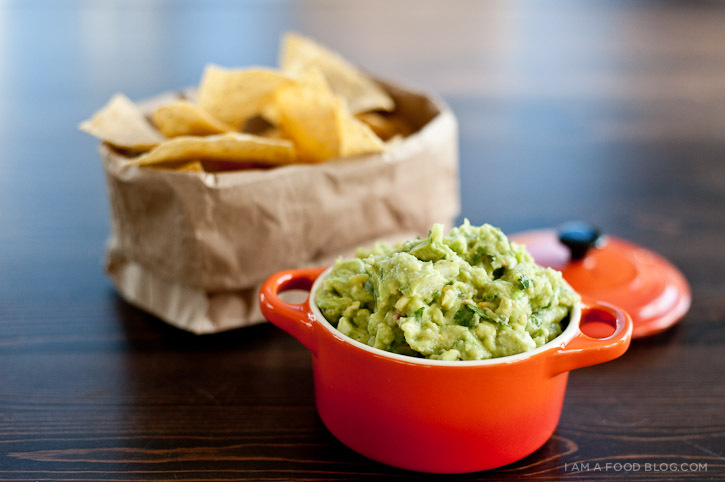 And….im making this guacamole! Try roasting the pineapple. This chef did it at a party and gives it a great favor!!! An added bonus is that the guacamole stays green overnight. I tried this before I read this recipe and added about a tablespoon of pineapple juice as well as chunks of pineapple. The flavor does not overpower since it has hot peppers and cilantro to balance it out. Your website it gorgeous! Love it. Great job.